Childhood is a very special time where children first develop a relationship with learning. The world is full of wonders to be explored and there’s questioning at every turn, with a simple walk down the road taking an age, as the inquisitive preschooler stops to examine so many curios that adults pass by. At this age, the relationship that a child develops with learning can be positive or negative, depending on their influences, and it’s no overreach to say that this will impact them throughout their lives, as they pursue higher education, vocational training and informal learning. Children at age 0-6 are sponges for information. At Montessori, each and every classroom is thoughtfully curated and set up to cultivate curiosity, independence, and self-discipline. Because different regions of the brain develop, organise and become fully functional at different times, there are periods, particularly during the early years, where particular experience is more effective to facilitate development in a specific region. Montessori education is child-led, with educators closely observing each child in order to set up relevant activities. Each child’s program is regularly reviewed in order to cultivate progression as well as reinforce particular activities to strengthen specific learning. Activities are not age-related, as children do not all develop at the same rate, but presented to the child when they are ready and curious. Children learn in a number of different ways. • Visual (spatial): Children prefer using pictures, images, and spatial understanding. • Aural (auditory-musical): Children prefer sound and music. • Verbal (linguistic): Children prefer using words, in speech as well as writing. • Physical (kinesthetic): Children prefer using their sense of touch, particularly through their hands. • Logical (mathematical): Children prefer using logic, reasoning and systems. • Social (interpersonal): Children prefer to learn in groups or with other people. • Solitary (intrapersonal): Children prefer to work alone. Montessori educators provide a host of experiences that utilise different learning formats to gain skills and cultivate understanding. Opportunities for learning are everywhere, especially at this formative age. Preschoolers are learning to become more independent of their parents and caregivers and want to make their own decisions. When empowered in this decision-making appropriately and without danger, their sense of independence, self-confidence and competence grows. This age is particularly willful and it can be frustrating for parents of preschoolers who constantly want to assert themselves. 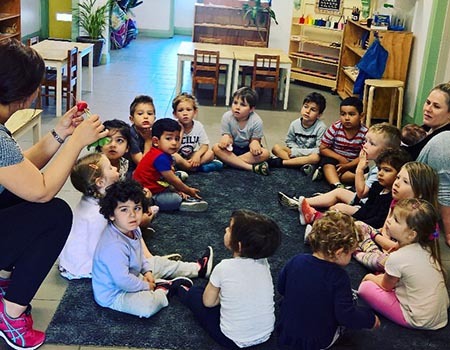 Montessori educators are experienced in helping preschoolers negotiate their emotions, be mindful and respectful of their peers, particularly their younger peers in mixed-aged classrooms, and to develop self-discipline and persistence to stick with a task or activity. 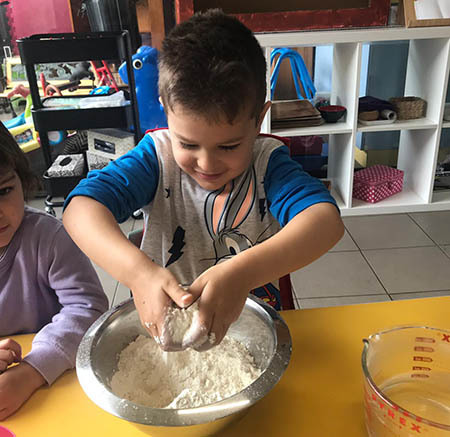 Preschoolers are naturally keen to feel helpful and relevant to others – this desire is cultivated in Montessori with the introduction of everyday tools such as hammers, screwdrivers, knives, scissors, and polish, which children are taught to correctly use for their proper purpose. This cultivates a sense of accomplishment and independence, which is further channeled into other, informal lessons. 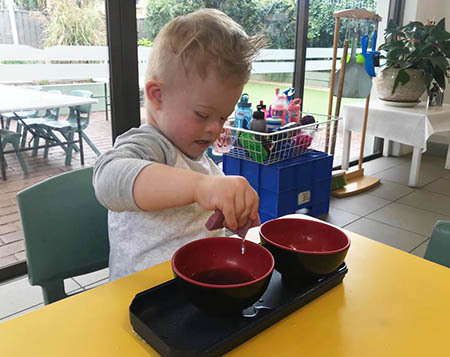 The classroom extends into all facets of a child’s life with everyday activities offering a host of “teachable moments” – this is another reason why Montessori schools and preschools have stronger relationships than is typical between educators and parents. Dr Maria Montessori believed that children have an innate positive attitude towards learning and need an atmosphere of calm, beauty, and good humour. This is supported by neuroscience, most notably, that the emotional context of an experience influences memory. Neuroimaging has discovered that words which are stored in a positive emotional context are remembered better than words stored in a negative emotional context (Erk et al., 2003). Respect for the child is paramount in Montessori education so while the preschooler may be willful, they are rarely frustrated in the classroom, as educators skillfully guide their emotion into the next activity. Higher levels of brain development include the development of executive functions in the cerebral cortex. This includes the ability to control impulses and self-regulate emotions and physical behaviours, interact socially, direct and sustain attention, hold an idea in your head, plan, map, use memory, recall, flexible problem solving and reflection. These skills are cultivated in the Montessori classroom through developing nurturing, close relationships with educators and fellow classmates. Abundant neuroscience research confirms that the best learning happens when children feel safe, loved and supported. Safety is required for children to reach out and explore. A nurturing, calm, familiar environment, where adults are attentive and attuned to children’s bids for attention and their basic needs for shelter, warmth, comfort and love are met develops curiousity and learning (Cacioppo & Berntson, 2004). The Montessori method encourages educators to: “Teach by teaching, not by correcting”. Children’s efforts and work is respected as is, rather than corrected or molded towards what is socially acceptable. Montessori education supports what neuroscience confirms: that positivity, nurturing, and developmentally-appropriate (not age-dictated) learning cultivates a healthy brain and a lifelong love of learning. Different Learners – Identifying, Preventing and Treating your Child’s Learning Problems, by Jane M. Healy, PhD.